Your body uses protein to support a ton of important functions, but let’s focus on what’s really important: its major role in weight loss. It helps to both rev up your metabolism and form gorgeous lean muscle, which means that getting enough of this powerhouse nutrient is essential for feeling and looking your best. Ideally, you should have around 0.36 to 0.8 grams of protein per pound of body weight per day, depending on your activity level. For example, a 130-pound woman should have between 47 and 95 grams of protein in a day. That may sound like a tall order, but there are plenty of ways to ensure that you get what you need. Well-known sources of protein include meats like chicken and fish, but you can also get it from vegan and vegetarian sources like beans, quinoa and kale. 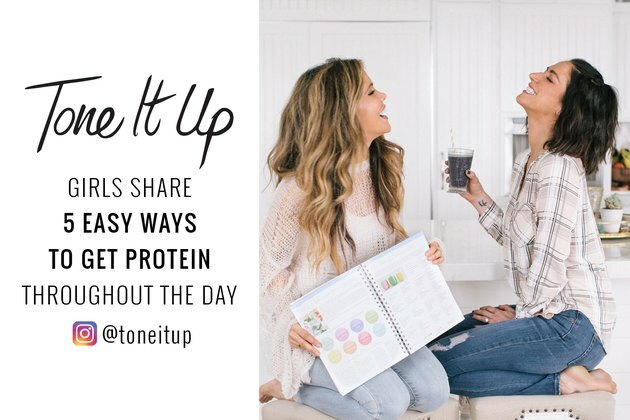 If that’s not enough, you can easily incorporate protein into your meals and smoothies in the form of plant-based protein powder, like our Tone It Up Perfect Fit Protein. Nevertheless, we know that when it comes to getting enough of this vital nutrient, the struggle is real. Here are some of our favorite tricks to help boost your intake. Oatmeal is packed with fiber to help you feel full, making it the perfect morning meal. Additionally, half a cup of cooked oatmeal delivers about three grams of protein. But you can actually squeeze even more protein into your morning by adding a scoop of our gluten-free Tone It Up Protein. If you’re someone who’s always rushing around in the morning, try our Piña Colada Overnight Oats. And since it’s summer, add some flair with tropical fruits like mango, pineapple and papaya. We’re huge fans of kale salads at lunchtime. They’re crunchy and light, meaning that they leave you feeling refreshed and energized. They also pack a protein punch. Just one cup of kale contains three grams of protein. Sprinkle two tablespoons of sunflower seeds on your salad for an extra three grams of protein. You’ll also get the essential mineral magnesium, which your body needs to recover and reduce soreness after working out. At dinner, we like to pair a lean protein like chicken, turkey or beans with some green veggies. This alone provides a whopping 40 to 50 grams of protein. If you usually have your lean protein with rice, try swapping it for quinoa. Quinoa contains twice the amount of protein as rice and helps to ward off those chocolate cravings after dinner by keeping your snack attacks at bay. 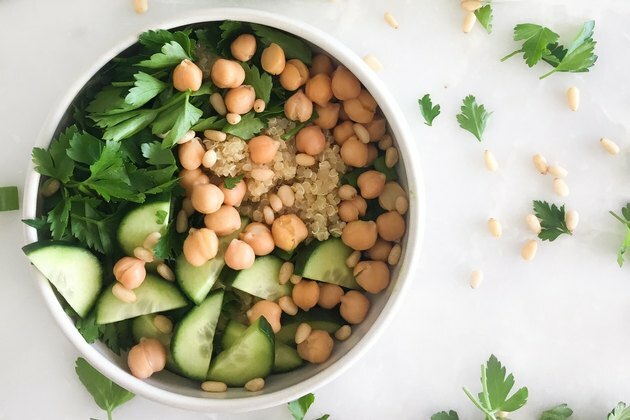 Check out one of our favorite quinoa bowl recipes for ideas on how to create the perfect, balanced dinner. Want even more science-based info to treat your body right? Join the Tone It Up Nutrition Plan. It’s packed with all the details you need to feel and look the leanest you’ve ever been. How do you get the protein you need throughout the day? What’s your favorite protein-packed snack? Will you be trying one of our recipes? Share your thoughts and experiences in the comments section!